Quercus Garden Chess made of solid wood applying exacting workmanship can even serve as a garden ornament. Also, it may become a peachy dash of color of holiday resorts, beaches, or downtown squares. 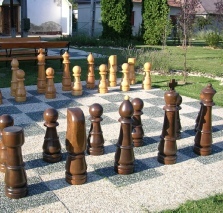 The outdoor giant chess set contains 32 pieces pickled, double lacquer-coated, but it does not contain the chess board – you are advised to prepare that from weather-resistant material (outdoor tiles, stone, handled solid wood, etc.). For optimal field-sizes, see 'Termékek'. For your chess set, we also offer a suitable carriage. Upon request, we also transport the garden chess sets ordered, and - in case of proper use - we undertake 1 year guarantee. Chess pieces for replacement are also available for all sizes, and you may order stand-alone chess pieces as ornaments, too. For further information on garden chess, please send us an e-mail or call: +36 30 841 96 37.